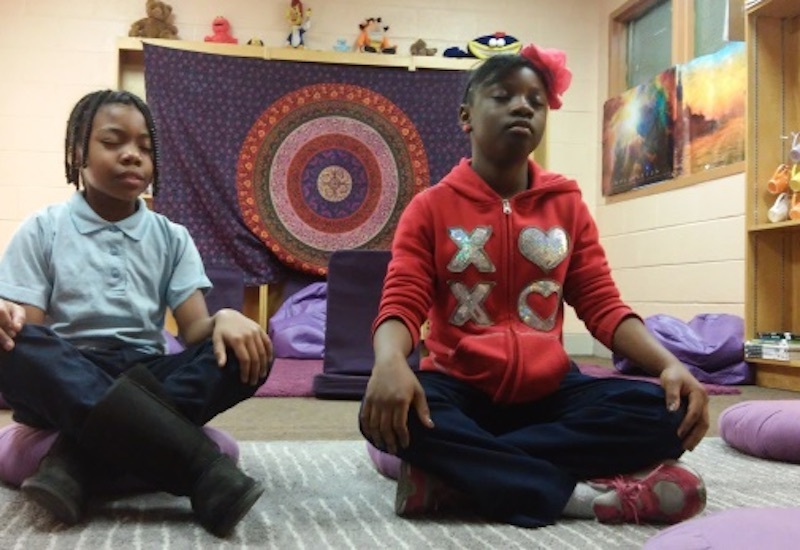 What if elementary school kids began each day with a mindfulness breathing exercise, had the option of taking yoga classes, and were sent to a relaxing room to chill and re-center themselves instead of going to the principal? While this scenario seems like it would likely occur in a progressive private school, it’s actually the reality for students at Robert W. Coleman Elementary in West Baltimore. And these unconventional methods are helping the school community: during the 2013-2014 year, there were no suspensions. The thoughtful exercises and practices are part of the Mindful Moment program of the Holistic Life Foundation, founded by Ali and Atman Smith, two brothers who grew up locally, and their friend Andres Gonzalez. The Foundation was created in 2001, and the need for a positive outlet for kids in this particular area has been critical recently. The low-income neighborhood has struggled with high crime rates, riots following Freddie Gray’s death while in police custody, and, according to the Smith brothers, a loss of a sense of family and local mentors for the children. The mindfulness exercises help engage the students, teachers, and staff to effectively address problems in a more beneficial way. For example, when a student is referred to the Mindful Moment Room, he goes through breathing and centering exercises with a staff member, discusses his feelings and emotions surrounding the incident, and works with the staff to figure out what mindfulness technique he could use next time a similar situation arises. As the year progresses, kids can recall their mindfulness “training” when asked, averting conflict on occasion and empowering them to take control over their actions and the emotions behind them. Visits to the Mindful Moment Room often decrease by the end of the year as well, as students become more familiar with these beneficial methods and how to effectively use them. These mindfulness techniques may not show up on any standardized test, although one school in San Francisco found that meditation helped increase happiness and academic success, but they will help the students at Coleman Elementary, their parents and teachers, and potentially their larger community find positive and beneficial ways to mindfully navigate through their days. Image via Holistic Life Foundation Inc.
As a yoga and meditation teacher and practitioner, I am delighted to hear about this. I know it works. I would love to be a part of something like this in public schools in Arlington where I live. Good story, Mindful Moment Room -- can be adapted and effective in the workplace, too. I would like to know more about how it works at this school so we can replicate it. Witb junior high kids they might want to act out to get to the mindfulness room. How do they deal with that? What if elementary school kids began each day with a mindfulness breathing exercise, had the option of taking yoga classes, and were sent to a relaxing room to chill and re-center themselves instead of going to the principal? While this scenario seems like it would likely occur in a progressive private school, it�s actually the reality for students at Robert W. Coleman Elementary in West Baltimore. And these unconventional methods are helping the school community: during the 2013-2014 year, there were no suspensions. The thoughtful exercises and practices are part of the Mindful Moment program of the Holistic Life Foundation, founded by Ali and Atman Smith, two brothers who grew up locally, and their friend Andres Gonzalez. The Foundation was created in 2001, and the need for a positive outlet for kids in this particular area has been critical recently. The low-income neighborhood has struggled with high crime rates, riots following Freddie Gray's death while in police custody, and, according to the Smith brothers, a loss of a sense of family and local mentors for the children. The mindfulness exercises help engage the students, teachers, and staff to effectively address problems in a more beneficial way. For example, when a student is referred to the Mindful Moment Room, he goes through breathing and centering exercises with a staff member, discusses his feelings and emotions surrounding the incident, and works with the staff to figure out what mindfulness technique he could use next time a similar situation arises. As the year progresses, kids can recall their mindfulness "training" when asked, averting conflict on occasion and empowering them to take control over their actions and the emotions behind them. Visits to the Mindful Moment Room often decrease by the end of the year as well, as students become more familiar with these beneficial methods and how to effectively use them. These mindfulness techniques may not show up on any standardized test, although one school in San Francisco found that meditation helped increase happiness and academic success, but they will�help the students at Coleman Elementary, their parents and teachers, and potentially their larger community find positive and beneficial ways to mindfully navigate through their days.